“Pajaritos”, or little birds in Spanish, got its name from its magical powers to allow its users to sing like birds when under its effects. Whether or not it's true or not is up for question. What’s not up for debate is how awesome this makes you feel. While the Pajaritos is very mild (in fact, it's the most mild truffle out there), that does not mean it's boring. Feel social, energetic, positive and engage in meaningful conversation. Light Hallucinogenic Effects. While this may not take you to an entirely new dimension in your mind, you’ll notice objects begin to shift and bright colorful patterns appear. Perfect for Tripping in Groups. Feeling anxious about your first truffle experience? Don’t be. Grab some friend with positive vibes and let the Pajaritos do the rest of the work. Unleash Your Creativity. Whether you have a school project, new job assignment or are an artists, unleash your creative potential with Pajaritos. Discover the Ancient Mayan Tradition with this Truffle. Used by Ancient Mayans, you can feel connected to the old traditional practice when you trip on this truffle. Great Low Price. 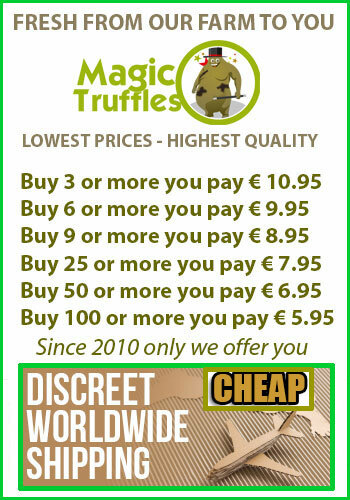 We make it our goal to keep costs low while delivering maximum quality truffle to our loyal customers. Sing with the birds and feel new creative energy you have yet to experience. Pajaritos ruffles are a great way to strengthen social bonds and feel connected. Order now! Another great starter truffle. The shipping was very fast to U.S. and I have been taking small doses that give me an overall sense of well being. These truffles also relieve my anxiety and help me to concentrate while thinking outside the box. I highly recommend these to any beginners! This was the first time I have done these Pajaritos truffles and any kind of hallucinogenic products. I was really looking forward to it and wow was it a good trip for me. First I took half the pack waited about 45 minutes not a strong effect. I was waiting for my girlfriend while i was sitting in my car so once she came I toke the rest. It didn't have a bad taste was nutty and left a sour taste in the mouth but not a pleasant sour taste but not to bad and unbearable. I got out the car once I came to my girlfriends house as soon as I stepped out of my car I felt so light like I was floating with a slight buzz went upstairs sat down and thought hmm might as well roll up a joint which added to the effect and made my buzz so much heavyer but I was wide awake so waited for another half hour then I started to smile uncontrollably then the giggles came in and I was very talkitive with my girlfriend, she didn't do it cos he was on med so she went to bed and I was sitting on my own just kept thinking and laughing uncontrollabley and a comedy film I watched was soo funny i spent the who'll night laughing and smiling was a great trip and will do it again but this time with something stronger I didn't get many visuals only laughing and smiling a lot with my senses very active and very aware and wide awake over all its was good product but I was expecting visuals but didn't get many so gonna try atlantis next going to wait a couple of days before I do it again looking forward to it again definitely a must try but not many visuals.